The day of Vaisakh Purnima, which usually falls in the month of May, is considered most sacred by Buddhists all over the world. This day is significant for three reasons. It was on this day that Gautama Buddha, the founder of Buddhism, was born as Prince Siddhartha at Lumbini in Nepal in 560 B.C. It is also the day when He attained enlightenment at Gaya in India, after years of search and enquiry into the causes and remedy for sorrow in the world. 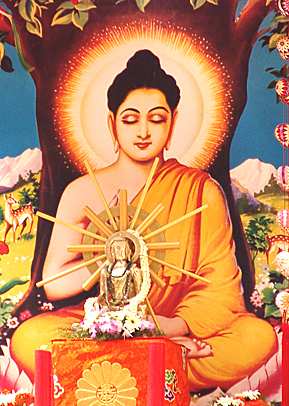 Thereafter, Siddhartha came to be known as Buddha, or the Enlightened one. He preached that desires are at the root of all sorrow and hence advocated the path of right conduct and the right use of senses as the way to enlightenment. He attained Nirvana (Unity with the Absolute) in 480 B.C., again on the day of Vaisakh Purnima. What is Nirvana? Today man aspires to attain Mukthi (liberation). What is Mukthi? It is not the attainment of a heavenly abode. Mukthi means freedom from suffering. You need to have Mukthi at three levels – body, mind and soul. For example, you are hungry. When you eat food, your hunger is satiated. This is a kind of Mukthi. Say, you are suffering from a disease. You take medicine and get cured. This is also Mukthi. All this is related to the body. At the mental level, Mukthi means controlling the vagaries of the mind. But true liberation lies in understanding the principle of the Atma which neither comes nor goes. This is termed as Nirvana. One should have Daiva Preethi, Papa Bheethi and Sangha Neethi (Love for God, fear of sin and morality in society). That is true Nirvana. Be away from sin. Understand that Daiva Sannidhi (proximity to the Divine) is true Pennidhi (wealth). But ignorant people are unable to understand the Divine principle. They feel that they can experience God through meditation. What is meditation? It is a way of life. While you are walking on the road or driving a car, if your vision is not focused on the road, you may meet with an accident. Concentration is necessary in all aspects of life. But concentration does not become meditation. One should go beyond concentration which means the mind should become still. You should be free from thoughts. That is true meditation”. It was the day of Buddha Poornima ten years ago. Baba was then not in Prasanthi Nilayam or in Bangalore but in the tranquil hill station of Kodai Kanal – the serene spot admist dark forests, tucked away in the Upper Palani Hills in the state of Tamil Nadu. Baba being in Kodai Kanal in 2003 was of course nothing new as many a summer of the Divine had been spent in this green valley; right from 1986 Baba often came here with a group of students and elders to the delight of the inhabitants of this hilly little town. But the 2003 Kodai Kanal experience was exceptional for reasons more than one. First, it was a most unexpected trip; generally Baba would visit Kodai Kanal in April and return by the first week of May or on rare occasions the week after. But that year Baba started His journey to Sai Shruti, His abode in Kodai Kanal, in the middle of May. And second, it was an extremely short trip – just a week or so, while all Kodai visits were for at least a fortnight or so. However, the most unique thing about this trip is that the celebration of Buddha Poornima happened that year in this most pristine and peaceful locale that on one side has this beautiful lake that was covered with sparkling white lotuses, and the other side were these huge, long and majestic silver oak trees as if always straight, firm and forward in their journey to greater heights, and when you look to the third corner your eyes are filled with the kaleidoscopic beauty of this motley colour of blossoms – purple, magenta, maroon, yellow and so on, perhaps covering all hues of human emotions. 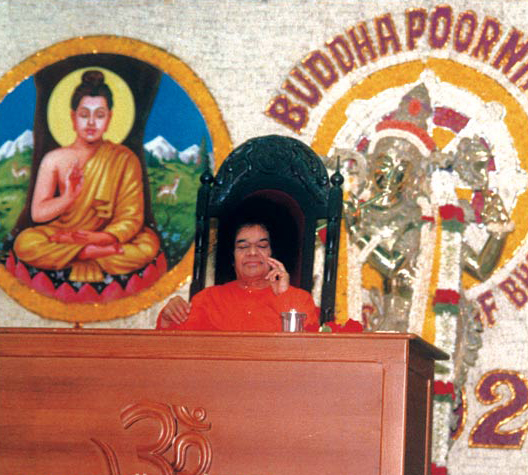 That morning as Baba was speaking to the boys inside Sai Shruti, He started elaborating on the pure nature of The Buddha, how He attained enlightenment and how He exemplified so many sterling virtues. Even as Baba was talking thus His palm suddenly moved in the air, caught that empty space, and immediately closed. And the next instant when the closed divine fist opened, all the boys could only gasp in awe! 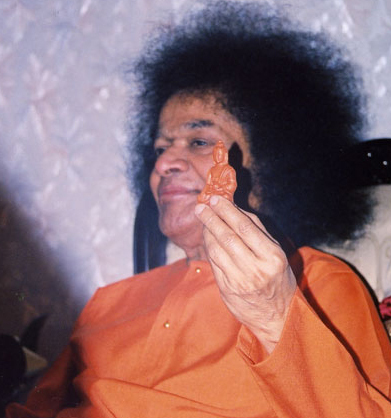 What Baba was holding in His hand now was such a marvelously done miniature Buddha, red and resplendent. Well, this is what happened a decade ago and Baba left us with something to ponder over for lifetimes. So who truly is The Buddha? And what is Moksha? On every occasion of Buddha Poornima, Baba stressed on how this festival should be celebrated and what should be our focus as we gleefully participate in this festival. “The same divine principle of love is present in all of you. When you take to the path of love, you will become Buddha yourself. This entry was posted in Puttaparthi, Sai and tagged BUDDHA, Buddha Purnima. Bookmark the permalink.